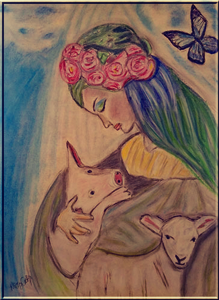 Niecy Catz is an artist that stands for Animal Rights, Domestic Violence Awareness, and love. She uses her art to draw attention to these causes. She is Vegan, and has recued many cats and dogs. She’s always been very artistic and creative, and used to draw and paint back in high school. She has been seriously pursuing her art, and increasing her skill level, for about four years now. She started drawing again while She was in an abusive relationship. It was a way of escaping, when she felt like she had no way out. She is mainly self-taught, other than some online, and correspondence art classes. Her Current Painting/Drawings are in Charcoal and Pastels. She is actively working towards learning other mediums. Her subject matter includes a lot of self-portraits. This is part of her journey of self-awareness. A way of journaling her feelings and things that she is working through, to become a better person. She also portrays animals as humans, to show that they are not that different from ourselves, and need to be treated with compassion. Originally from San Jose, California. She grew up very introverted, and spent a lot of her youth being bullied, and told she would not amount to anything. She is out to prove them wrong, as well as inspire others who have been told they could not achieve their dreams. She believes in magic and the power of positivity.